We here in Virginia are inventors and entrepreneurs. The internet is based in Northern Virginia, for goodness sakes. Yes, we have a way with influencing the globe. Take for example the watermen who devised more efficient and cheaper ways of harvesting our Blue Crabs from the Chesapeake Bay. Yes, it is we Virginians who are responsible for jumbo lump crab meat at USD$31.00 (+) a pound. There just aren’t that many crabs left. And what is summer without Blue Crabs? No jumbo lump crabcakes. No Crab Imperial. No She-Crab Soup. No pan fried soft shells. 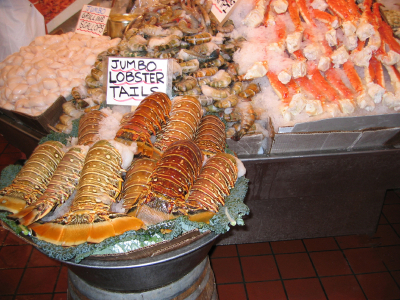 This year, it will be cheaper to eat lobster than to dine on the more humble crab. Chin up and uncork the champagne. The Easy and Elegant Maine Course Lobster Salad. White pepper and salt to taste. Garnish with fresh parsley, pickles and hard-boiled eggs. Mix well, lobster, salt, pepper, vinaigrette and chill for an hour to blend the flavours. Add in the celery, sherry, dry mustard and about a tablespoon (+) of mayonnaise. Stir to combine. Serve over a bed of lettuce and garnish with chopped fresh parsley, chopped pickles and chopped hard-boiled eggs. If you’re out of bubbly, a nice rosé goes equally well. This entry was posted in Entertaining and tagged Entertaining, luncheon, recipes, summer. Bookmark the permalink. Chin up, indeed. Lovely post, I hope to try the recipe soon. Hello Elizabeth and thanks for stopping by. I’m in Richmond, VA, not far from Washington. I used to shop at The Tiny Jewel Box when I worked on Conn Ave and later, on 18th St. Great place. I especially liked to shop their estate pieces for Mrs, then Miss, E. My first purchase was a Tiffany bone cuff by Elsa Perretti that she still wears. Great blog. I’ll be sure to check in before our next trip up. In the meantime, if you don’t already have plans for the 4th, Doc Scantlin is playing in Alexandria at The Carlysle Club.